Profiles and Photo Data: Messerschmitt Bf 109G6 NAG4 green double Cheron and double horizontal bars Friedrich-Wilhelm Kahler is about to show the German tank General Veiel the Bf 109G6 fighter-recce cockpit during the Generals visit summer 1943. Gruppenkommandeur Friedrich-Wilhelm Kahler was later KIA on Jan 6th 1944 while flying an identically marked Bf 109G6 Werknr 15856 in the Smolensk area. Remarks: KIA 6 January, 1944 (Magnus). 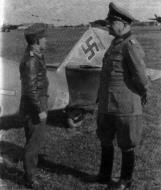 His first known victory, a LaGG-3 on 11 October, 1943. A 2nd, a LaGG-3 on 12 October, 1943. Nos. 3 & 4, both Il-2's in the Pankovo-Notnoye areas on 21 October, 1943. A 5th, a U-2 WSW of Nova-Strychchina on 6 November, 1943. A 6th, a LaGG-3 E of Borok on 15 December, 1943. A 7th, an La-5 on 5 January, 1944. Friedrich-Wilhelm Kahler was KIA on Jan 6th 1944 Smolensk area.